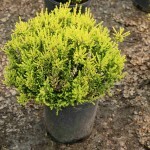 A small upright shrub with a beautiful transition of foliage colors. Summer foliage is a golden yellow changing to terra cotta then a rich brick-red in winter. Bright purple-pink flowers appear July thru September. 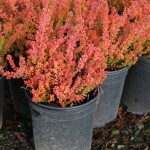 It grows best in full sun, in an acidic, well-drained soil. Shear lightly after flowering to maintain a tidy form.